KAHUKU, Hawaii (AP) — A pair of endangered Hawaiian geese that have hatched goslings and settled on Oahu's north shore were likely on their way back to Kauai from the Big Island when they stopped in Kahuku, a federal biologist said Wednesday. 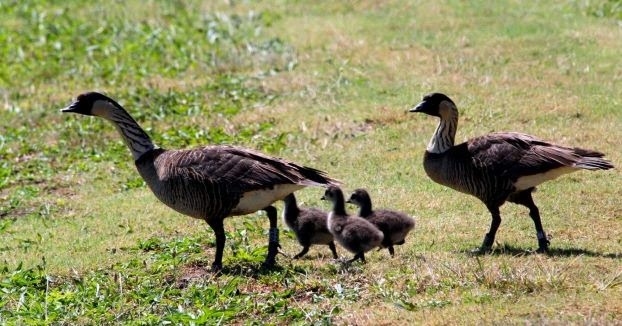 The nene pair was taken from Kauai to the Big Island within the last two years as part of a program to move geese away from lagoons next to the Lihue airport, said Annie Marshall, a U.S. Fish and Wildlife Service staff biologist. They are the first Hawaiian geese to make a home on Oahu since at least the 1700s, nesting at the James Campbell National Wildlife Refuge. Another pair of nene was spotted at Makapuu on Oahu's south shore, but didn't stay. There were just 30 of the geese in the 1950s when biologists began breeding them in captivity to save the population. Now there are more than 2,000 on Kauai, Maui and the Big Island. "We were hoping, as recovery progressed, that eventually there would be nene on all the main islands where they used to occur," Marshall said. "It's a little sooner than we thought it would happen but it's all part of recovery." Cute Otter Eats Powerful Gator?